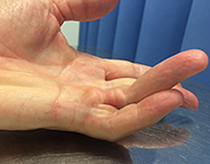 Xiapex is a great, minimally invasive way of treating Dupuytren's contractures via a simple injection. This treatment was introduced to the UK a few years ago and has an excellent track record. There are several ways of treating Dupuytren's contracture. Dependent on the individual presentation, there is a range of treatment options including Xiapex injection, needle fasciotomy and traditional open surgery. I will assess you and discuss with you, what the best option is, considering your functional demands, occupation and type of contracture. What is Xiapex and how does it work? Xiapex is an enzyme injection, that can digest and break down Dupuytren's tissue. The enzymes are selected such that they will only digest Dupytren's tissue, but won't damage any other tissue like skin/nerves/tendons etc. Once I've seen you in the clinic and a decision has been made to go ahead with Xiapex treatment, you will book 2 appointments. During your first appointment I will inject the affected finger/fingers with Xiapex. This is only mildly uncomfortable and most patients tolerate the injection well. I will then apply a padded bandage. You will the return in 24 to 48 hours for the xecond stage of the treatment. During the second appointment I will numb the finger with local anaesthetic. I will then gently correct the deformity. In some patients, the finger will easily straighten, in others a loud snap can be heard/felt. Thanks to the local anaesthetic you shouldn't experience any pain. No further dressings/bandages are required, unless you are unfortunate and experience a tear of the skin-this can sometimes happen. You can start using your hand without restrictions straight away. You will see the Hand Therapist a few days later who will fit you with a custom made splint (to be used at night) and who will ensure that you will make a full recovery. The first picture shows the finger just before the injection. One can see the thickened Dupuytren's tissue at the base of the finger. There is also a minor contracture of the little finger that didn't require treatment at this stage. The second picture shows the finger 2 days later, just before the straightening procedure. The swelling and bruising is normal. I have already injected the local anaesthetic. The third picture shows the finger following the manipulation with full correction of the deformity. Xiapex works in most patients, but there is a low failure rate. Careful patient selection is the key to success and some contractures are more likely to respond to Xiapex than others. I will discuss this with you in the clinic and I will make you aware, if I feel that there may be an increased risk of failure. The manufacturer recommends, that the treatment can be repeated twice, if the first attempt failed. Unfortunately there is no cure for Dupuytrens, not even with Xiapex. As with any treatment for Dupuytrens there is a risk of recurrence, no matter whether patients had surgery or a Xiapex injection. There is some research to suggest, that the recurrence rate following treatment with Xiapex might be slightly higher than following surgery. At the same time Xiapex treatment is minimally invasive and therefore has many advantages over traditional surgery. I am happy to discuss the pros and cons in more detail during your first consultation. Failure: There is no guarantee of success with this treatment. While approximately 90% of patients get very good correction of their deformity, there are some patients where there is only partial or no improvement at all. Those patients will benefit either from a further injection or traditional surgery (both of which will have to be funded either through your insurance or by yourself). Recurrence: Treatment with Xiapex doesn't cure Dupuytren's disease, the injection simply helps straightening a deformed finger. You will continue to have Dupuytren's disease for the rest of your life and it is likely that you will get a recurrence either in the same finger or in other fingers. Unfortunately there is no cure for Dupuytrens, all the different ways of treating this condition including surgery and Xiapex only straighten bent fingers. 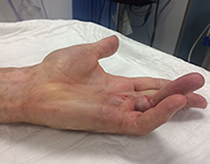 If recurrence of Dupuytren's should cause significant problems again, treatment is possible, either with Xiapex or surgery, that depends on the individual presentation. Skin tears: The worse the deformity, the higher the risk of the skin tearing in the process of straightening the deformed finger. 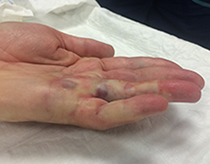 This is common if the contracture is severe and rare in mild contractures. Even large tears heal well with simple dressings. Healing time varies depending on the size of the tear. This could take roughly 1-4 weeks. Swelling and bruising: You will almost certainly get swelling and bruising in the hand and finger. This is normal and not of any particular concern. Both swelling and bruising will settle with time. If you are on anticoagulants (blood thinning medication) this medication should be stopped prior to the Xiapex injection, please discuss this with me or your GP to insure this is done safely. Allergic reactions: Severe allergic reactions including anaphylactic shock have been described, but are very very rare. You should stay in the waiting room for 30 minutes following the injection and ask for help immediately if any of the following occur: wide spread redness or rash, swelling, tightness in the throat/chest or difficulty breathing, repeated sneezing, itchiness, dizziness. Tendon rupture: If injected in the wrong place there is a very minimal risk of Xiapex digesting tendon tissue leading to rupture of flexor tendons. This is a very rare problem. A ruptured tendon may require surgical treatment followed by a lengthy time of rehabilitation. Pain: The injection isn't usually too painful. For the straightening procedure you will get an injection with local anaesthetic (and the local anaesthetic agent stings badly when injected) to keep you comfortable. Some patients may require pain killers (like for example simple Paracetamol) following the injection or the straightening procedure. Interaction with other drugs: The use of Xiapex is not recommended if you have received tetracycline antibiotics within 14 days of the injection. Pregnancy: The use of Xiapex is not recommended during pregnancy.